Flavored with strawberry puree Stephanie Chen's swiss meringue butter cream will cover her chocolate cake. She makes her California Dreamin Cake recipe during the showstopper bake in season two episode 1 of The Great American Baking Show titled "Cake Week." She is topping her cake with a tiny gum paste figure inspired by her hometown of Santa Monica as she models it after Santa and shows what Santa would be up to if he spent some time at the beach. 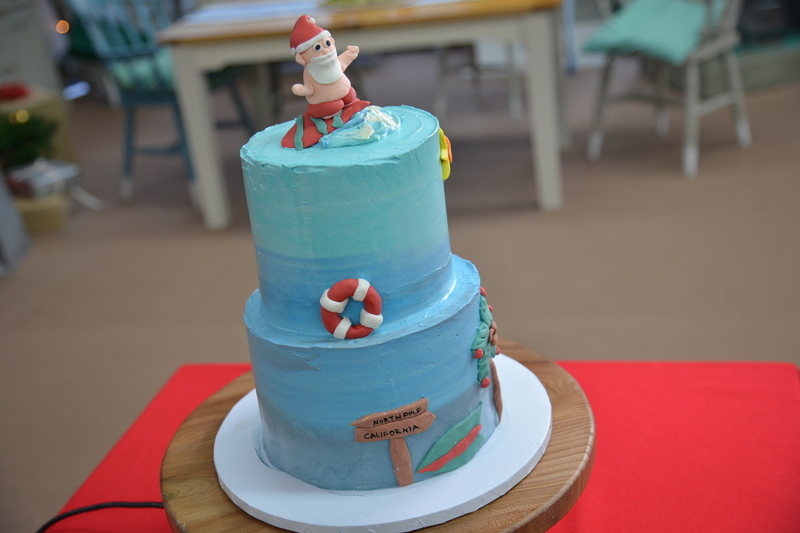 Watch the full episode of "Cake Week" to see if Santa helps Stephanie's bake come out on top. Ameri-color gel coloring: red, orange, yellow, black, leaf green, dark green, brown, peach, sky blue, royal blue, white. 1. Heat oven to 350°F / 176°C and grease and line 3 x 6" pans and 3 x 8" pans with parchment paper rounds. Set them aside. 2. In a medium bowl, place a metal sifter on top and add flour, cocoa powder, onyx coca powder, baking soda, baking powder, sugar and salt. Sift into bowl. Take large hand whisk and continue to incorporate dry ingredients until well mixed. 3. In mixer bowl, add eggs, buttermilk, oil and vanilla and mix well. With mixer on low speed, incorporate dry ingredients into the bowl. Then add in coffee last and continue to slightly on low. Do the rest by hand. 4. Pour batter into pans evenly. Tap pans against the table to get rid of air bubbles before placing into the oven in the middle rack. 5. Bake for 30-35 minutes or until toothpicks are removed and fully clean. Cakes should feel springy to touch. Bake 3 cakes at a time in the oven. Make sure to rotate the cakes 75% of the way through baking time. 1. Cut/clean fresh strawberries and place them into a food processor to puree then set aside. Will only need 1/3 of the puree for one batch of buttercream. 4. Place bowl back on stand mixer and begin to mix on medium high for about 10 minutes. Will want your egg whites to be at a stiff peak. 5. When bowl is cool to touch, remove whisk attachment and add paddle attachment. Start adding in butter one tablespoon at a time and incorporate all the butter on the slow setting. 7. Then only in 1.5 batches add in the strawberry puree and food coloring. Mix in more as needed but make sure there's enough for the outside white butter cream to be colored. Then leave the rest of it without puree to be mixed with different colors. 1. Once cakes are cool, cut each layer in half and set aside. Start building each cake with the strawberry buttercream. 2. Build the 8" cake on the cake drum and build the 6" cake on a cake board. 3. Apply crumb coat with VANILLA and set into the fridge. Do the same with 8" and 6" cake. 4. Let it chill until buttercream has set. Ideally 30 minutes. 1. Divide the rest of the buttercream into 5 different bowls. 4. Fill piping bags with different colors. Place a wet paper towel on the turntable so the cake doesn't move around. 5. On the 8" cake, start on the bottom with 1-2 rounds of brown then switch to the dark blue for 1/3 of the cake. Towards the middle/top switch to the medium blue. Continue medium blue for the top of the 8 inch cake. Clean up the sides and put it in the fridge to harden. 6. On the 6" cake, continue from the bottom with the medium blue for ½ of the cake then switch to the sky blue for the rest and the top. 7. Make sure to save some MEDIUM BLUE buttercream for touchups later. 8. Return to fridge to chill and continue working on decorative characters. 5. Make a sign for North Pole & California. 1. Apply 4 dowels into the 8" cake and cut so they're flush to the buttercream. 2. Grab the 6" cake and place on top of the 8" cake carefully. Smooth out any imperfections on the buttercream. Apply 1 more long full cake dowel down the middle of the cake. 3. Apply gum paste characters to the cake.